For troubleshooting tips, please see www.lacrossetechnology.com. Monitor the outside temperature from a distance of up to 330 feet with the wireless atomic clock and temperature station. 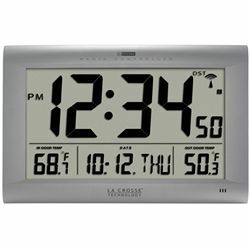 A battery-powered sensor reports outdoor temperature while the easy-to-read clock also reports the exact time, date and indoor temperature. The clock synchronizes itself periodically to the atomic clock signal broadcast from Fort Collins, Colorado, accurate to one second for every 60 million years. Stations require 2 AA batteries and 3 C batteries, not included.